A little over 15 years ago I sat in my bedroom in Parkland, Florida looking at a class schedule for ATC. I needed to take a specific computer class to learn a program that was required for a job I wanted to get within Huffy Bicycles (my current employer back then). There were several class times available so I just flipped a coin and let fate pick it for me. Well, lady luck was on my side because on the first day of that class I met the most wonderful woman I had ever met. 8 months later Carolynn and I got married in a small church in Boca Raton, Florida. I can honestly say that the past 15 years have been so very wonderful thanks to my wonderful wife Carolynn. Totally exhausted. That is how both Carolynn I felt this morning upon awaking. This might be the last two day festival event for us. Race today went better for me. I almost did not race because I was just totally spent from setting up the course this morning and stressing over race management details. The decision was made and I got ready and planned to just race for series points. I am leading the Single Speed division, which by the way had a nice 13 rider turnout yesterday, and needed to finish in the top 10 to keep a gap on second place Bill Anderson. As I line up next to Rich Anderson and the rest of the combined 53 rider Single Speed/Men's Cat 4 field, I had no energy and just knew that my streak of hole shots was going to come to an end. As the US AC officials do their thing and send us off, I roll away and settle into an easy pace up to the first turn. Somehow I find myself out front again. Either no one likes to lead or I just have way to may fast twitch muscle fibers :-) To the left is a nice pic that Cameron took of me while leading. Do I look fat? Rich was behind me about 1/2 through the first lap and I wanted him to come around and lead and hopefully get a gap on the other Cat 4's. I settled into my race not really expecting much. I only had one speed today and planned to keep it at a steady temp and just gain points. I got passed by Andrew Coe on the first lap and knew I could not keep up with him. Just yesterday he got 5th in the Men's Elite 1/2/3 class. Today he decided to race with us Single Speeders on his new Specialized rig which is cool and make it hard on us old fat guys :-). By the end of the sec ond lap Kyle Shour took over second place in the SS class and I was a solid third, but Dan Oldehoeft from team Crackanoon was fast closing in. On the last lap I was on the edge and put in one last effort to try and stay out front. The effort brought me up to Rich and a couple of the top 4 guys. I went past them and actually felt like I was "racing". Over the barriers and back on the bike. A quick look over to my left I see Dan right there. This going to be close. I hear Rich yelling encouragement. The legs start to go. I dig deep but still Dan bridges up to me. I decide to let him lead into the wind in hopes that I could somehow recover enough over the next 1/2 mile to be able to sprint past him at the finish. But it was not to be. He opened up enough of a gap on the final climb to the "Wall" to take the final podium spot. Still a good day for me given that I wasn't going to race 45 min prior to the event. Christopher had a great day today. He rode much better than yesterday and looked really well ag ainst a solid junior field. Just like his dad he got the hole shot and I think lead until the same spot I has I did. I guess, as people often say, he takes after me. Joey Todd got by him on the first lap and never looked back. It is good to see a junior with so much enthusiasm for cycling. Joey put in two solid rides to win both days of the festival. About 20 minutes into the race he looked rough and was backing off the pace big time. I saw 3rd and 4th place catching fast and ran out to try and motivate him. I know first hand what he was going through and knew that he needed some help. I ran around the course trying to motivate him without making him upset. It seemed to work because he rode very well the last lap and put in some distance on 3rd. Man I have to stop starting so fast. It is going to kill me one day...... Got another hole shot today. I think that makes every cyclocross race this year I have either got the start or lead during the first lap. We need to start adding a hole shot award or something. I know I can win that for sure. Felt good for nearly the whole first lap leading then I decided I need to take it easy to conserve some energy. I was already tired from setting up the course/event for the past two days and did not want to blow up. I backed it down about 15% which was not a good idea. I was soon getting passed and fell back about 5 spots. When I tried to pick up the pace to keep up with my teammates Rich Anderson and Mark Cole, my legs said "are you kidding me??" I tried my best to keep a steady effort and motivate myself to try and bridge back up. I know I have the speed to do it, but not today. Lesson learned - Once you got it up, keep it up. I slowly fell back to 4th in the Single Speed class. On the last lap I made one last effort to catch back up to 3rd in my class. Even tried to get old Doug Stone to help me bridge up. But he was also tired from helping to set up the course. Pounding stakes does that to you :-) I will take the 4th place points and try again for the podium tomorrow. The course will be super fast and packed down nicely. Christopher had a bad day today. He was not feeling like his normal cheerful self. He felt very sleepy and his legs just working. He basically just rode around today and finished up in second place. Hopefully he will feel better tomorrow. It was nice seeing a good turnout of junior riders. Especially two new junior girls. This weekend is the big Smithville Cyclocross Festival. A lot of man hours have been put into this event to make it the best possible. Thank you to everyone who has helped. I hope to see many of my friends this weekend. Everything is looking great for two days of cyclocross fun. I hit the breaking point again this week. Complete breakdown. I have way too many things on my plate right now. Something has to go. Yesterday I planned to race the Capital Cup in Topeka, but as I sat down Friday night listing my To Do List for next week and beyond, I came to the realization that I am again doing too much in my life. My body is getting really tired and I am not enjoying anything in life as it passes by. Take care of my family first - Carolynn my soul mate and my wonderful son Christopher. Maintain homestead, vehicles, bikes, yard, etc. There is more, but I am getting tired. Something has to go, but what? Off to mow and clear the course for new weekend's big Smithville Cycloross Festival. Wanted: Teammate for the 2009 TransRockies Challenge. Another great turnout for the De Stad series. 199 entries for today. I hope to see 300 entries on a normal basis in two years. If we continue to put on good races it will happen. As for my race, I got the start and lead SKC Racing's Andrew Coe (Andrew also won the Men's 3/4 today - he is fast) for the first lap. I looked back about 1/2 through the 2nd lap and noticed we had a nice gap on 3rd. I really wanted to win today, but knew I was at my limit and if I tried to keep up with Andrew I would blow up and on this course that could cost you a lot of time. The top riders from the Cat 4 race were slowly reeling me in (Single Speeds were started first). With 2 laps to go Mark Cole got by and I stayed with him. I was still in 2nd in the Single Speed division so I was not to concerned about Paul Webb and Doug Stone closing in on me during the last lap. I was done with a 1/2 lap to go and just put her on cruise control knowing that I had 2nd locked up. I think I found out I do better with 2 days rest before an event (if you call working your arse off promoting a race and setting up a course all day Saturday rest). For the rest of the cross season I am only going to train 4 days a week and rest for 3. With age, I seem to need more rest with the stress of racing and work. Headed up to Omaha with Mark Studnicki for what was supposed to be the first two rounds of the Nebraska Cyclocross Series, but found out earlier in the week that there is no official series this year. Just two stand alone race weekends. The Omaha rounds and then the Lincoln rounds in late November. I decided to just race the Men's Cat 1/2/3 class instead of the Masters or Cat 3/4 class so Mark would not have to wait around for 2 - 3 hours doing nothing waiting for his race. Well let me tell you, next time we will wait around and/or get up extra early so I don't have to suffer for an hour embarrassing myself. I am just not fast enough to ride with the 1/2/3's. The Swanson Park course just does not agree with me. I have raced there the past three years and have never ever felt good or had a good race there. That place just does not like me. Saturday I felt o.k. but still only managed 9th out of 15 riders. Here are the complete results My bike set-up was not very good. 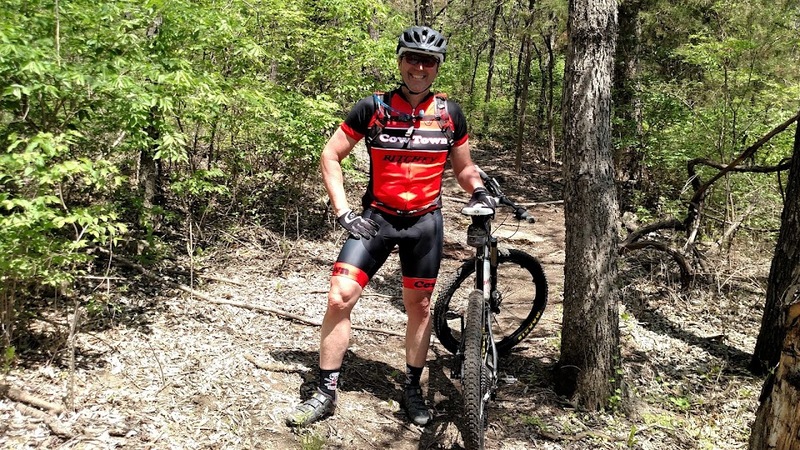 I chose to run a set of Ritchey SpeedMax tires. I think the main problem was they were 700 x 32's. However, they measured somewhere close to 700 x 28's. Those things just did not hook up well on the dry course. They worked well in the mud and roll really well, but they d o not corner well on a dry course. I was sliding in the corners and felt all out of control. I just rode a fast tempo and hoped that my pace was fast enough not to get lapped and stay ahead of the guys I was in front of. My goal of not getting lapped was not met as Mark lapped me on his way to the win. Sunday was one o f my worst days ever. I went down during the warm-up and on the first lap in the same location. 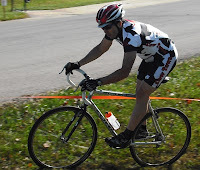 Never got going during this race and actually stopped for a lap trying to fix the shifting on my bike as I bent the derailleur hanger when I went down on a dry slick corner. End result was 9th out of only 10 riders. I must be getting old or something. I only have a small scrape on my leg, but my knee is killing me today. Must of twisted it a little when I went down and now some swelling has taken place. I wish it was my left knee. At least then I would be balanced out with injuries. As of now, my right shoulder is killing me and my right knee. Nothing a little time and ice will not heal.